In all my years coaching there are always some constants with training kids. One of them is nerves for cheer tryouts. 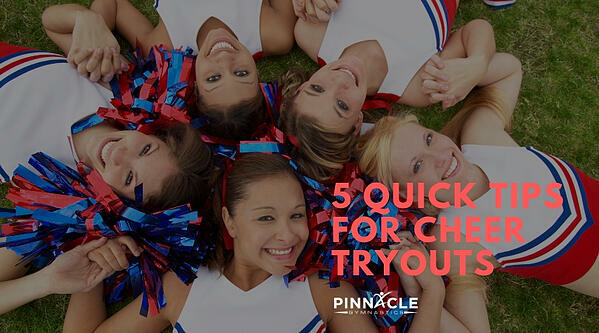 While we could go on and on about things to work on and tips for a successful tryout, I thought that I would try to shorten the list to just 5 things for cheerleaders and or tumblers. Most of the time kids (and even some adults) that come to me are in a big hurry to get a new trick or skill. Does anyone remember how long it took for you to learn the alphabet or tie your shoes? You probably messed up a few times here and there. It may have taken hours, days, or even weeks to learn. It took practice and time. Now those skills are relatively mindless now that you have put in the hard work. A "back tuck" or a "hand, hand layout" will also take time to learn to do it correctly and consistently. Repetition is arguably the best and worst part of just about any sport or activity. You have to do the same thing over and over again. The key here is that you must be willing to do it correctly over and over again. Going back to the alphabet...how did you learn it? Singing the song, over and over again. Same goes for cheering or tumbling. It takes a lot of repetition to learn the moves, then perfect the moves, and eventually make the moves look so effortless that people might swear that you were born able to do them. Consider taking Tumbling Classes to learn the acrobat skills in cheer. Every season I dreaded learning the cheers. It was one of the things that I struggled with the most, but after spending a couple hours practicing on my own, it became no big deal. Taking ownership of the material that you must learn for the tryouts is a huge mental hurdle to overcome. It is ultimately up to you to perform the moves and tricks out there on the field, court, or floor. You can hold yourself back or push yourself forward. You can mentally and physically practice or spend your time doing other things. Most successful people will be those that can take responsibility for the best (and worst) outcomes. They learn from the mistakes to improve as well as the successes. There is also another side of cheerleading that some people do not always realize, and that is being a leader! You will have eyes on you all the time. Little eyes, coaches' eyes, teachers' eyes, parents' eyes, teammates' eyes. You are a representative of the student body, a delegate of the values the school has, the epitome of never-say-die school spirit. Can you accept that responsibility? By setting goals we put ourselves on a road map to success. Now we also have to make sure that our destination is actually on the GPS. By that I mean, if the goal is not measurable then it is hardly attainable. "I'm going to be the best cheerleader!" Sounds good, but how can you measure that? "I will have the sharpest motions at the game" Now that is measurable. You can video yourself and others on the team, practice in front of a mirror, have contests with your teammates, and lastly you can focus on them during the game itself. Also remember that there is a time factor to it. If you missed your goal, did you actually give yourself the time to get to the goal. Six weeks is hardly enough time to learn a back handspring safely if you have no experience. Kind of like driving downtown in the rain, there might be some delays and speeding is dangerous, so take your time. Cheerleading is supposed to be a fun, athletic, and social activity. My best advice to most girls trying out is to remember that it is just cheerleading, life goes on. Tryouts are sometimes very political and the best athletes do not always make the team, likewise the most enthusiastic doesn't always make the team. We can only control ourselves, and by that, I mean our Spirit. Relax a bit so that you can show that. The tricks may be difficult or they may be easy for you, but you can choose to have a great smile and attitude throughout the experience no matter what. A cheer team is kinda like a football team. The coach has to look at everyone and find the proper amount of bases, flyers, tumblers, jumpers, and dancers. You are amazing...but we can only have 1 quarterback on the field at a time. Be flexible and be open to any position. Cheerleading started in the stands and is about bolstering school spirit, so whether on the floor or in the stands....be loud and proud!